You read here at Atimelyperspective.com a few weeks ago all about the Panerai Composite watch. Now the brand moves forward with another cool material rarely used in watchmaking but guaranteed to always be unique: Bronze. 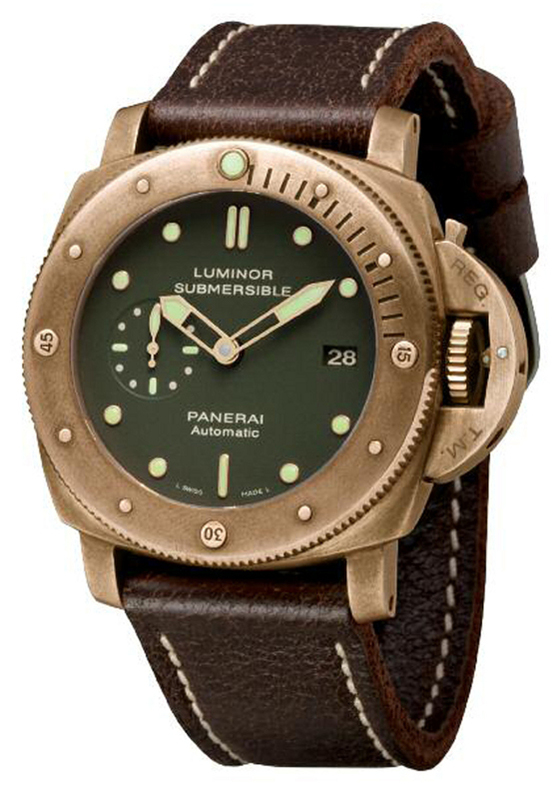 This new Luminor Submersible 1950 3 Days Automatic Brozno watch features a case made of CuSn8 bronze. It is an alloy of copper and tin in a pure state. The 47 mm bold beauty is water resistant to the corrosive actions of sea water – an important point with the Submersible. What’s ultra alluring about it is that with time, and with exposure to the elements, as well as to the skin, the bronze forms a patina that makes each watch unique in and of itself. The watch, with three days of power reserve, retails for about $10,100. This is one watch that definitely ranks as a Panerai winner. This is my next acquisition. Really looks great. Dial appears less green than in the photo.